Homemade bandsaw clamp intended for holding small and irregular pieces. 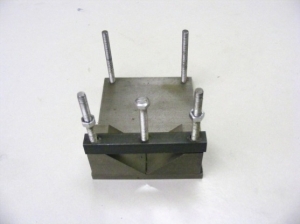 Base constructed from 100 x 75 x 6mm steel plate; vee blocks are cut from 25 x 25mm square bar. Vee block is screwed to one end. Four M5 studs protrude on the vee block and at the corners of the other end to accept the clamp bar.